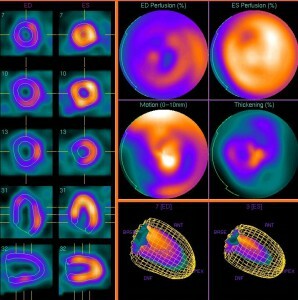 With myocardial scintigraphy the perfusion (blood flow) of the heart can be measured at rest and during exercise by the use of radioactively marked substances. It is thus possible to diagnose poor vascularized areas of the heart without invasive measures such as coronary angiography (cardiac catheterization). Myocardial scintigraphy shows the blood flow conditions of the heart muscle itself, whereas coronary angiography visualizes the state of vessels which supply the heart muscle with blood. The myocardial scintigraphy serves the clarification of coronary heart disease (CHD), in particular to clarify the question whether constrictions of coronary vessels have led to a relevant circulatory disorder of the heart muscle or not. The myocardial scintigraphy is one of the most accurate methods to detect clinical significant circulatory disorders of the heart muscle at an early stage. 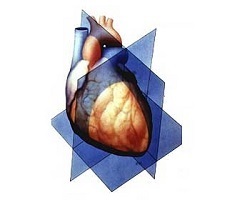 The heart muscle is supplied with oxygen and nutrients by a dense network of blood vessels, the coronary vessels. Symptoms such as feeling of pressure or burning in the chest, possibly radiating to the arm are alarm signals for diseases of the coronary arteries, the so called coronary heart disease (CHD). Problematic with regard to coronary heart disease is that even when individual coronary vessels are already completely blocked, it may remain symptom free. Difficulty in breathing or pains in the chest under physical exertion (stress) may indicate the presence of coronary heart disease. The timely detection of circulatory disturbances of the heart by myocardial scintigraphy may help to prevent a heart attack though measures such as heart medications, vascular dilation or bypass surgery. If results are unsuspicious, thus in no way pathological findings in myocardial scintigraphy, the risk for a cardiac event in the next five years is less than one percent. This has been demonstrated by scientific studies. The significance of the myocardial scintigraphy is markedly higher than that of a single computed tomography (CT scan) or magnetic resonance imaging (MRI) of the heart. Especially when other examinations provide rather vague references to a disease of the coronary arteries, a myocardial scintigraphy is of great importance to establish a final and accurate diagnosis. Radiation exposure during myocardial scintigraphy is significantly lower than that of a coronary catheterization examination. It corresponds to the annual natural radiation exposure on Earth or a CT scan of the lungs. The significance of the myocardial scintigraphy is markedly higher than that of a computed tomography (CT scan) or magnetic resonance imaging (MRI) of the heart. Especially when other examinations provide rather vague references to a disease of the coronary arteries, a myocardial scintigraphy is of great importance to establish a final and accurate diagnosis. In addition, the examination allows a risk classification when compared to a standard collective of healthy people. This helps us to assess whether the patient is more likely to benefit from a drug therapy or if a heart catheter is necessary. In addition to the localization of circulatory disorders (ischemia zones), the extent of infarct areas can also be indicated quantitatively. This method is also very well suited for the evaluation of the disease progress. Radiation exposure during myocardial scintigraphy is significantly lower than that of a coronary catheterization examination. It corresponds to the annual natural radiation exposure on Earth or a CT scan of the lungs. The Myocardial Scintigraphy examines the blood flow to the heart muscle at rest and during exercise without surgical intervention. Usually, there are two appointments necessary on two separate days. The stress test is used for diagnosis of circulatory disorders. The reason for a striking stress test, yet inconspicuous rest test, is often a treatment requiring circulatory disorder of the heart muscle. The test material is specifically prepared for each patient and is very expensive. Therefore we ask for early notification in case you cannot perceive your appointment (not later than the day before until 17:00 clock). Many thanks! 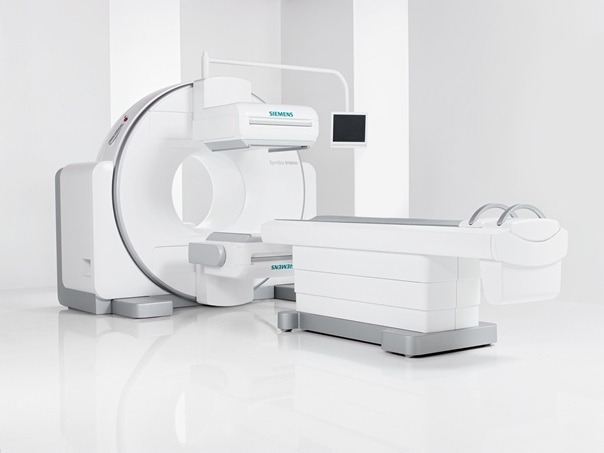 By means of SPECT / CT, the duration of the examination is reduced while simultaneously image quality and patient comfort is improved. What is important before the examination? You may not eat or drink at least 4 hours before you come to the examination. Please do not smoke or chew gum et cetera to avoid high digestion activity. Please allow a total of about 2 – 3 hours. Informed consent discussion, resting phase. For this you lie about 10 minutes on your back. What is important before the stress test? Don’t take beta blockers (e.g. bisoprolol, metoprolol), calcium channel blockers (e.g. verapamil, amlodipine) and nitrates on examination day and the day before. Other antihypertensive drugs should be taken. image. Please do not drink coffee, cola, black or green tea, energy drinks, c hocolate, caffeinated painkiller at least 12 hours before the examination. Informed consent discussion, injection of a small amount of a radioactively labeled substance during exercise ECG or drug load with a circulation-stimulating agent (adenosine / regadenoson).